My morning routine takes me through a progression of reading. I have two broad categories; Bible/Devotional and Secular (business/news/technology/sports). For the secular category, I use the app feedly to pull a sampling of internet happenings into a smorgasbord of current events and ideas. I flip through the articles picking a few that catch my eye as interesting. Rarely, do the categories of my morning reading coincide. That is what surprised me during this morning’s ritual. This article, in Forbes of all places, was an insightful read for people actually engaging in their working world as complete embodiments of spiritual/secular personhood. What if we lived in a world where 1 + 1 did not equal 2? What if you could never be confident in the sum really being equal to two. What if we could not rely upon the observations of the world around us? We could not know anything with confidence. An excellent article regarding a very reasonable question. I am praying for a college friend this morning. I recently learned from a Facebook post that he has abandoned the Faith. My heart breaks for this lost sheep who has begun a pilgrimage along a path toward another “gospel”. I am reminded once again of the importance of abiding in Christ. I am reminded once again of my own propensity to wander. No child of God ever gets beyond their need for an open Bible and a powerful Savior; no lost sheep is beyond the call of the Good Shepherd. I pray that my friend will recognize the voice of our Good Shepherd and follow Him home. I made an error awhile back. I realize that will shock many of you. We were traveling to my son’s flag football game in a nearby small town. We turned right rather than turning left and proceeded several miles in the wrong direction. My wife had gotten on-line and printed out the directions; we diligently followed the direction but still ended up in making an error. The consequences of having bad directions was for us to get a little lost and either be late to the flag football game or to miss it entirely. I would argue that getting on-line and printing off the directions was probably a reasonable amount of effort given the potential consequences. It is gopher season once again here in southern Idaho. 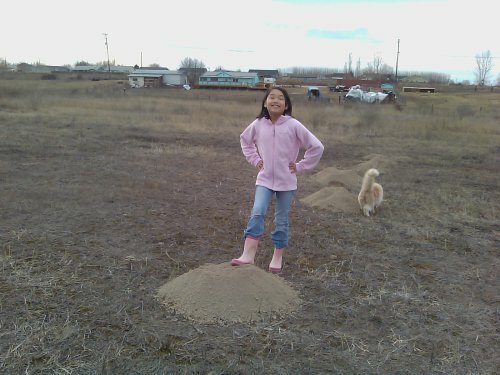 Last night, as my wife and I walked our property checking gopher traps (so romantic), she reminded me of this post. So, I thought it might be a good one to reblog. I am a ruler; a sovereign noble over more than nine acres of flora, fauna and terra firma. My kingdom produces a variety of produce including cheatgrass, kosher weed, thistle, white-top, knapweed, ragweed, stinkweed, milkweed, morning glory, hemlock, crabgrass, Russian olive, among other varieties of the unwanted. My kingdom is not a land of agricultural produce. 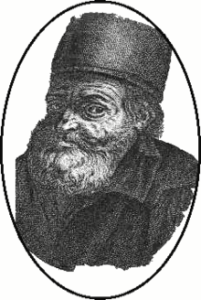 Nicolas Flamel (ca. 1310-1418, pictured above) looks like he could be St. Nicholas, with that full beard and impish face. In fact he lived long after and far away from the well-known saint. Flamel was a French scribe and manuscript seller. He also dabbled in alchemy. 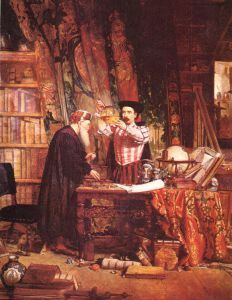 Alchemists were those who, especially during the Middle Ages, experimented with various materials and procedures to turn ordinary metals like lead into gold. Another dream of theirs was to discover an elixir of life—a potion that would provide eternal life. By the seventeenth century, legends had developed around Nicolas Flamel. Some claimed that he had discovered the Philosopher’s Stone, the alchemical substance that would turn lead into gold and produce the elixir of life.